Falkirk are back at Horne Park Sunnyside this weekend when Lasswade visit. 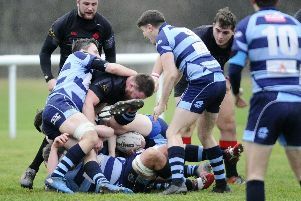 Regrettably Falkirk suffered their fourth defeat in a row, after leading by 17-7 at one point of the match and seemingly in control,at New Anniesland last weekend but a domineering closing quarter display by Glasgow Accies saw them deservedly take the spoils. It all looked so different for Falkirk early on when Glen Faulds broke over from loose play,and Fionn Call duly converted. Twelve minutes later the same man was at it again, andFaulds just scythed his way through for his brace. Nevertheless Accies responded and were in touch 7-12 at the break desipte Falkirk going close almost on the whistle. 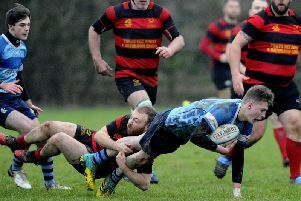 In a closely contested restart Falkirk got the upper hand in the 53rd minute when Chris Lawson crashed over an unconverted try, following a lengthy period of pressure. However in an amazing turn of events on the hour mark, Accies’ Scott Simmons to intercept and dash in under Falkirk’s uprights from well inside his own half. Clearly rocked by that Falkirk were exposed just nine minutes later when Accies added another touchline skirting try with relative ease with McGuire converted both tries. Very much under the cosh in the closing minutes Falkirk attempted to run the ball from their own line and when they lost control Gordon McGuire snapped up the loose ball and barged his way over for Accies bonus point awarding try. At the end of the day it was another disappointing result for Falkirk, but arguably had they been awarded what looked like a good try from Andrew Gillespie in the closing seconds of the first half then who knows what the final outcome would have been? This week Falkirk entertain Lasswade at Horne Park. Kick-Off is at 2p.m.